After wearing the adidas Adipure Crazyquick for the first time, I struggled to find the right adjectives to describe the shoe. I struggled with a description because the Crazyquick doesn’t feel like any shoe I’ve ever played in. I told Finch after the first hoop session that I forgot they were on my feet by the end of the run – and that is a very good thing. One thing is clear though: this is a finely-tuned, precision engineered piece of footwear and is a performance beast. As I’ve noted in each of my previous reviews, I value fit more than anything else when it comes to performance sneakers. The Kobe VI is my standard in terms of fit, as it brought the upper to the foot, locked me onto the footbed and moved with me. Yeah, well, the Crazyquick is now the new standard. When you’re talking fit with the Crazyquick and putting the shoe on for the first time, you’ll immediately notice two things: the Techfit upper enveloping your foot and the Sprintframe chassis locking the midfoot and heel in place. 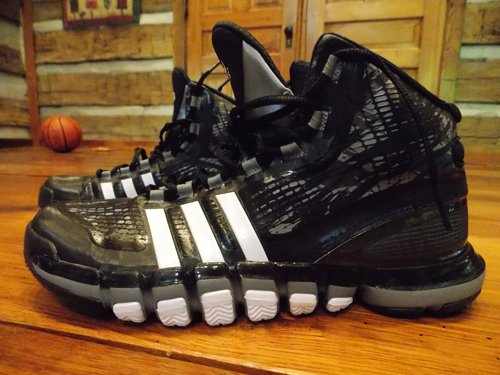 Techfit is not a new technology to the adidas brand – it’s been used in compression tops and bottoms, as well as a couple of running models, for a couple of years now – but this is the first version we’ve seen on a basketball shoe. The upper basically feels like a neoprene bootie base with strategic overlays – the three stripes enveloping the midfoot give the upper added lateral stability. The graphic pattern of the upper reminds me of the way that the Kobe VI used “scales” to give the shoe texture as well as added strength. Sprintframe has been criticized in the past (notably on the Crazy Light models) for being too small, but the chassis on Crazyquick fully wraps the heel and extends through the midfoot. The heel and midfoot are completely locked in place. I experienced absolutely no slippage and the fit is glove-like from heel to toe. Dual ankle notches aid comfort around the ankle bone and range of motion, and the mid cut does a great job of giving you a supportive feel while not restricting movement whatsoever. I’m not sure what else to say regarding the fit, other than that the Crazyquick is the single best fitting shoe I’ve ever played in thanks to the TechFit/Sprintframe combination and bootie-like upper. This shoe becomes part of you and moves with you as an extension of your foot, and that’s exactly what I want. 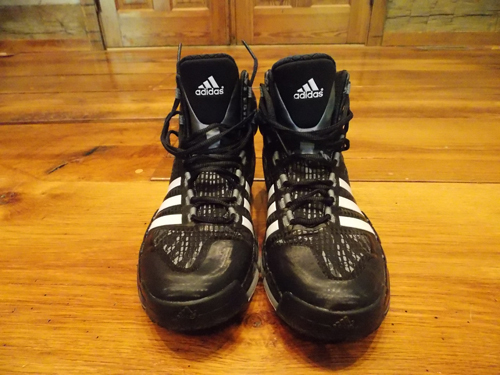 One final note: the lacing setup is slightly asymmetrical, which allows the three stripes on the forefoot to wrap around to the top of the foot to provide extra lockdown and support. It’s the little things, folks. The Crazyquick was absolutely perfect in this aspect as well, providing the best court feel I’ve ever experienced. The 17-pod outsole moves naturally through the footstrike and moves with you through any type of cut, defensive slide or sprint. The Crazyquick is reportedly the most weartested shoe ever produced by adidas, and that level of testing and refinement shows up in the transition. Getting all the pods to work in harmony is something that must have been fine-tuned hundreds of time. Crazyquick designer Robbie Fuller said he wanted the transition to be like a centipede, with each pod gripping the floor precisely when it should. The shoe does just that. I’d liken the sensation to wearing a minimalist running shoe or a well-cushioned Nike Free from a flexibility standpoint (the shoe still provides support – I’ll get to that later). The transition is smooth and rolls through the footstrike with stability and unparalleled court feel. There were a couple aspects of the cushioning setup I found interesting. Obviously, you’re going to give up a little bit of impact protection in order to get that great court feel so the Crazyquick is not necessarily plush and padded in the cushioning department. Impact protection is adequate though, and responsiveness is excellent – aided by the perfectly tuned outsole which allows you to push off and go whenever you demand it. When Finch and I first discussed the shoe, he was initially (and rightly) skeptical of the lateral stability/rigidity of the shoe given its deep flex grooves and carved-away outsole. Again, the shoe’s engineering came through. If you remove the insole, you’ll notice a rigid plate (part of the Sprintframe chassis, I’d assume) running from the heel to the midfoot that gives it good, lightweight stability while allowing the outsole pods to do their job. Again, I can’t understate the level of engineering and testing that this takes. 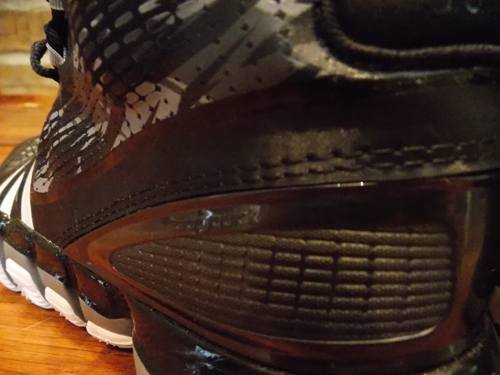 (If you don’t understand how midsole construction affects the cushioning unit, check Finch’s review of the flawed Hyperdisruptor.) 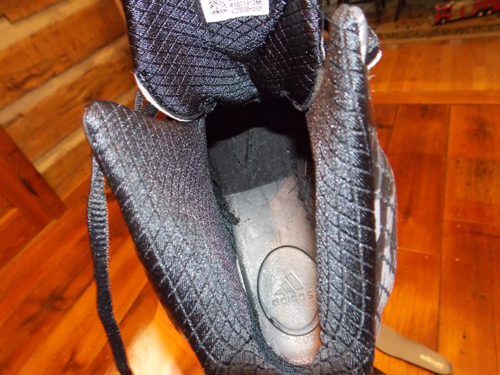 In the center of the plate directly underneath the heel you’ll find a small foam circle, indicating the adiprene-cushioned midsole that makes up the cushioning platform. I enjoyed being able to physically see the construction and it helps you understand how they designed such a great setup. It’s herringbone all around and in various angles, and the traction is superb. Deep grooves on each of the outsole pods allow the pods to grip the floor securely and provide reassuring stop and go ability no matter how sharp the cut. Four zones and 17 individual pods work in concert to provide elite level traction. Not much else to say, but I’m happy that they went with the tried and true pattern underfoot, and it certainly pays off from a performance standpoint. Materials/DurabilityTime will tell for the upper of the Crazyquick when it comes to durability. The Techfit upper feels and fits amazing, but it is almost like a neoprene bootie with supports fused on strategically so it remains to be seen how long that lasts. I’m not doubting the durability, but since it’s a new materials setup we’re required to withhold judgement. 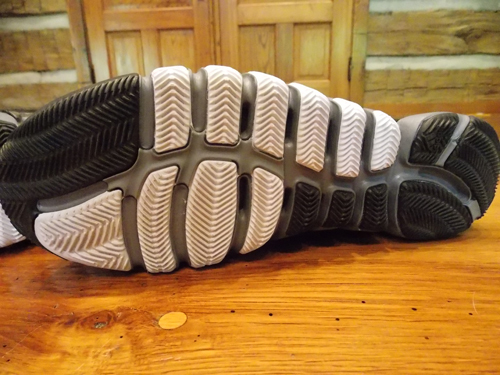 I believe the outsole and midsole will hold up just fine, as thick, durable rubber was employed for the outsole and the midsole has remained firm. 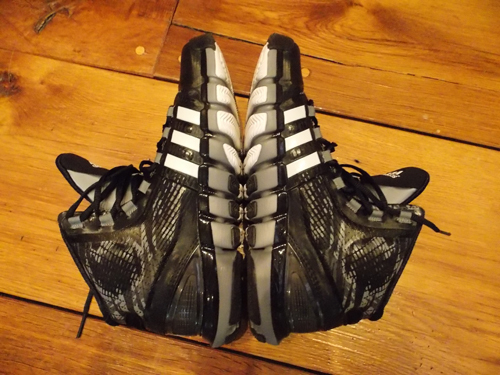 In conclusion, the adidas adipure Crazyquick is one of my all-time favorite performance shoes at this point. A ton of engineering, fine-tuning and development was put into this shoe and it shows. In a performance market where it seems like corners are cut on plenty of models, it’s refreshing to play in a shoe that bills itself as a performance beast…and actually backs that up. adidas introduced a new thought process with the Crazyquick line, employed new technology and updated some existing tech, and came away with one of the best performance shoes on the market. do you think cushioning is good enough? To me, it is good enough. The cushioning allow the shoe to do what it needs to – which is be really responsive, flexible and have great court feel and lateral stability. The shoe is designed to make quick movements and move with you, and the upper and heel fit like a glove. The midsole setup just helps it do that. If you’re looking for a bunch of impact protection in terms of cushioning, then it’s probably not the shoe for you. Thick durable rubber? Almost everybody I know has said that the rubber is so thin it would ground down in weeks outdoors. The herrigbone pattern is pretty deep and the rubber compound used feels very firm. I played in them indoors 4-5 times a week for a solid three months and haven’t had any excessive wear issues. I haven’t played in them outside and don’t know anyone that has, but I can tell you indoors I’ve had no durability issues. Not really built to be an outdoor shoe in my opinion, and I probably wouldn’t hoop outside in a $140 pair of shoes until they were beaters anyway. Jake — quick question on sizing between the Kobe VI and these Crazyquick 1s. I know you mentioned dropping to an 11 in many shoes to get a closer fit. Can you share what size you wear in the Crazyquick versus the Kobe VI? Looking to pick up a pair of the CQ for cheap and it seems like you’re always right where I’m at with shoes in terms of sizing. Thanks in advance!